PROVIDENCE - The relationship between Curt Schilling and Rhode Island appears irrevocably damaged, as the former baseball star-turned-entrepreneur trades blame with the governor over the collapse of Schilling’s video game company, 38 Studios LLC. The finger-pointing between Schilling and Governor Lincoln Chafee escalated Tuesday after the former Sox pitcher for the first time spoke extensively about the demise of 38 Studios. He accused the state, which granted his video game venture up to $75 million in loan guarantees, of breaking promises to help the company remain viable just as it was closing in on a deal with an outside company to salvage its major unfinished video game. The former baseball star also disclosed that he has invested some $50 million of his own money into 38 Studios, and he risks losing it all. Late Tuesday Chafee rebutted Schilling’s accusations, in particular that his pessimistic statements about the viability of 38 Studios deterred outsiders from saving the company. The recriminations come as the two sides are also trying to find an outside investor to revive production of 38 Studios’ major enterprise, a sprawling online video game code named Copernicus. The company appears all but out of business following a dizzying turn of events that began in mid-April with 38 Studios warning the state it was running short of cash, to missing a scheduled $1.1 million payment to Rhode Island on May 1. The company eventually ponied up the funds only after not paying its 400 employees. Then last Thursday all those employees were laid off without warning, leaving Rhode Island on the hook for some $50 million in state-backed loans that 38 Studios has so far spent. 38 Studios relocated from Maynard, Mass., to Providence in 2011 after Chafee’s Republican predecessor, Donald Carcieri, agreed to provide the company with the $75 million in loan guarantees as part of a broader effort to jump-start a video game industry in Rhode Island. At the time, Chafee was running as an independent to replace Carcieri and criticized the deal as a foolish giveaway to an untested entrepreneur. Schilling has repeatedly declined to comment to The Boston Globe and again on Tuesday did not respond to requests for an interview. The Providence Journal story not only provided his only detailed remarks on the demise of his company, but also additional information about Schilling’s personal investment in 38 Studios. He told the newspaper he had invested $38 million directly into the company and guaranteed another $12 million in personal loans. He has insisted to government officials that he does not have any more money to put into the company, despite a lucrative baseball career during which he earned $114 million. The newspaper said Schilling had lost weight, had trouble sleeping, and alternated between upbeat and downcast during the interview. He also rebutted critics who accused him of hypocrisy for being in favor small government while asking a cash-strapped state for more money. The core of Schilling’s complaint against Chafee is that the worst of those events could have been avoided had the governor been more generous and patient. Specifically, Schilling contended Chafee and his aides had promised to grant 38 Studios more than $8 million in tax credits, which the company would sell and then use the proceeds to get through its funding problem. Schilling also suggested that Rhode Island officials had agreed to allow 38 Studios to miss the $1.1 million payment in order to make its payroll May 15. Missing the payment put 38 Studios in default of its loan terms, which subsequently made it ineligible to receive the larger state tax credit awards. The Journal reported that 38 Studios made the $1.1 million payment May 18 with funds forwarded by an investor willing to buy the tax credits. Schilling seemed most bitter about Chafee’s public remarks about 38 Studios’ financial condition, in which the governor asserted the company’s first product was a bust and questioned its viability because the Copernicus game was another year away from release. That latter information was a closely-guarded secret inside 38 Studios, and Schilling told the newspaper he warned Chafee and officials of the Rhode Island Economic Development Corp. that such remarks were undermining the state’s investment. At the time, Schilling asserted that a video game publisher, which he declined to name, had tentatively approved a $35 million deal to finance a sequel to 38 Studios’ first game, Kingdoms of Amalur: Reckoning, but pulled out after Chafee suggested the company was close to insolvency. Chafee has been consistent in his remarks about the 38 Studios’ situation: that his responsibility first and foremost was to protect Rhode Island taxpayers from losing any more money, and that he had an obligation to keep them informed about developments at the company. While Chafee initially indicated that 38 Studios had qualified for the state tax credits, he later balked because he feared it was going out of business. 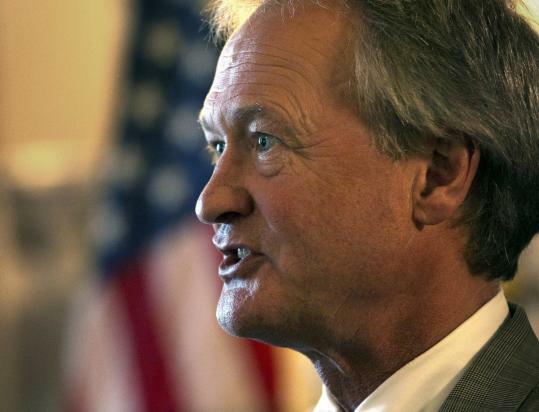 On Tuesday, Chafee also said Schilling failed to understand the process of securing the tax credits. As for the $1.1 million, Chafee said his administration worked with 38 Studios executives for weeks on a resolution after the company missed its payment. He also stressed that Schilling and his colleagues gave the administration little time to find a solution and were even less helpful in sharing critical information about the company’s condition. When asked if he could still work with Schilling, Chafee said, “I can work with anybody.’’ He also said there’s “no indication’’ so far that 38 Studios is preparing to sue the state or file for bankruptcy protection. Andrew Caffrey can be reached at caffrey@globe.com; Todd Wallack at twallack@globe.com.